Laptop connections for VGA and audio are available at lawyer tables, for use in litigation support and evidence presentation. Evidence that makes use of digital video or audio will require the use of a laptop. It is imperative that equipment is tested in advance of a proceeding. Do not plan to test with any other equipment than exactly what will be used during court. Not all equipment is compatible with the evidence presentation system. You must contact the courtroom deputy to arrange a date and time for testing. The display resolution must be set to 1024p x 768p. If possible, do not plan to use a widescreen format laptop. If a widescreen laptop must be used, be advised that the required resolution will display black down either side of the screen. If the image on the courtroom monitors is skewed to the left or right, use the shift wheel to center the image on the monitors. Connect the laptop with the VGA/audio cable provided by the courtroom deputy. 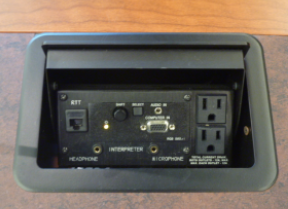 Each table has two laptop connections; use the select button to switch between the two locations if more than one laptop is used simultaneously. After powering-on the laptop, ask the courtroom deputy to choose the appropriate evidence table. If the laptop display is not visible on the courtroom monitors, press the laptop’s function and F keys simultaneously to toggle the display (e.g., Dell: Fn+F8 | HP/Sharp/Toshiba: Fn+F5 | Panasonic: Fn+F3 | Sony: Fn+F7 | Mac: F7 only). Audio evidence presentation is played back in mono, not stereo, mode. If evidence is recorded in stereo, audio can sometimes be cancelled out during playback. If this happens, adjust your laptop audio playback from stereo to mono.